Moving to the United States three months back was quite a cultural crossover for me and learning to adapt to my new lifestyle came with a lot of daily struggles and challenges. For example, chit chatting with everyone and anyone, everywhere, inside elevators, in shopping malls and restaurants. I’m still mastering the art of small talk in the States! Another challenge after settling in our new apartment, was deciding what to cook daily. Before we moved in our present apartment, we lived in a shared accommodation. Until then it was normal to eat out, order take-outs, survive on Maggi noodles and cook occasionally since we had to share kitchen space with other people. Moving into our own space, Maggi noodles and eating out routinely became a thing of the past. I had to figure out a daily menu of homemade food. Until then I had not realised the effort put in by my mother and mother-in-law in preparing food each day, thrice! So we set out working on a list of items that both of us could eat and enjoy. Unfortunately, the list of food items that both of us enjoy is quite short. I am a very picky eater and can survive on Aloo (Potatoes) all my life and very few vegetables made it to my list, whereas my husband can eat almost anything, as long as its cooked well. So, we decided on another scheme, which was that every alternate day I would cook things that I don’t eat so that he doesn’t have to eat potatoes and the few meagre vegetables I enjoy on a daily basis. This is when I chanced upon a recipe on Pinterest. I had never cooked an Aloo Baingan dish in my life, so I was looking for a recipe that’s not too complicated with too many ingredients and at the same time nutritious and delicious. I have cooked this recipe multiple times and my husband couldn’t be happier! Instant Pot – a life and time saver! Unlike the previous two recipes that I have shared, the recipes can be cooked entirely in Instant Pot. But here I choose to make the onion masala in a skillet or kadhai for better flavor and also because the bottom of the Instant pot starts glazing too soon. To avoid that I prefer preparing it in a skillet. 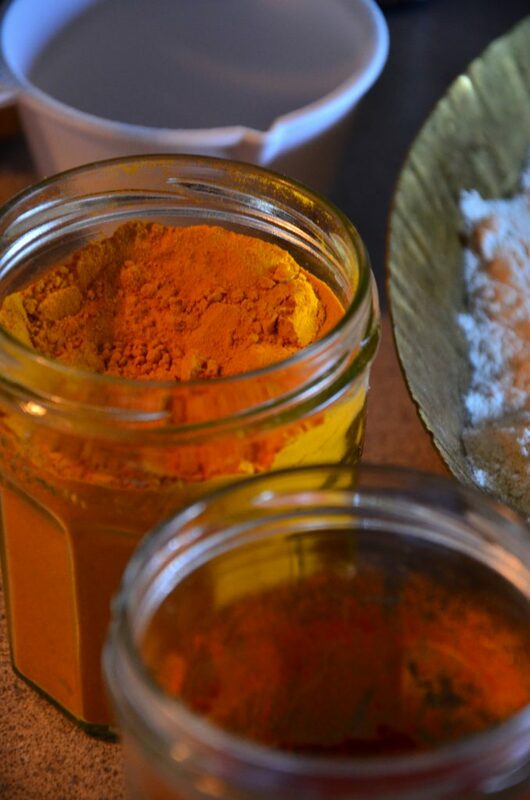 But, for those who do not have a cook top you can prepare it wholly on the Instant Pot, just add a tablespoon of water in case the masala glazes the bottom. This delicious and satisfying Instant Pot Aloo Baingan is adapted from myheartbeets.com. This dish is very simple to prepare. Even though it is cooked in an Instant Pot, it does not lose out on the flavour of the eggplant and the aromatic spices. 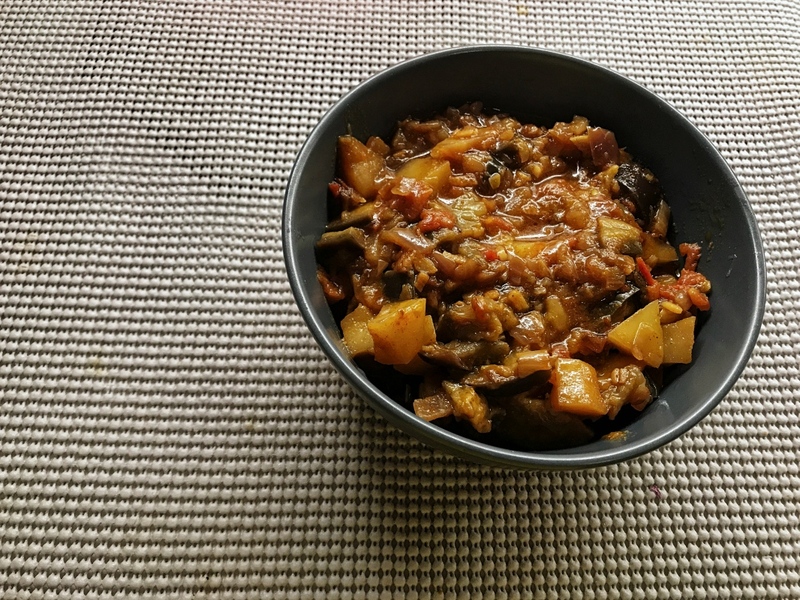 So, if you’re looking for a quick and nutritious side to your meal, this Instant Pot Aloo Baingan might be the answer! Heat the oil in the skillet and wait for oil to get hot. Add the cumin seeds, and let them splutter for 20 seconds. Add the onions and saute until they are translucent . Add the minced ginger garlic and sauté for another 2 mins on medium heat. Add the tomatoes and the dry spices and continue to stir until oil begins to separate. Let it cool down; mix it with hand blender if you want and set it aside. If you’re making the masala in the Instant Pot, turn on the sauté mode for 15 minutes and use the same method as above. You can also make a large batch of Onion Masala and refrigerate it, and use it later. Press the sauté button and the oil and allow it to heat up. Add the cooked Onion Masala, chopped potatoes and eggplant and mix it. Add salt to taste, and cancel the sauté mode. Serve this delicious Masala Aloo Baingan with Paranthas or Roti.